I have another Baking Basics post for you, and I think it’s one that many of you will find extremely helpful! 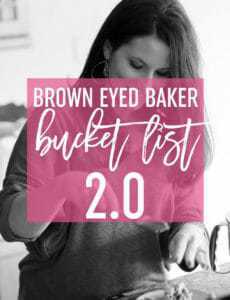 This was on my list of topics to tackle, but since posting my chocolate chip cookie bars last week and receiving a lot of questions about the inclusion of bread and cake flours in the recipe, I thought I would shoot it up to the top of my list. Today we’re tackling all of the most common flours – what makes them different, the best things to make with them, as well as substitutions for each. As you’ll see below, protein content is the primary differentiator in flours and plays an important role in how the flour performs in different recipes. Let’s dig in! Protein Content: A moderate range of 10% to 12%. Description: The middle-of-the-road protein content allows the flour to be sturdy enough to hold its structure for things like yeast breads, but still light enough to produce a tender crumb in a layer cake. Wheat’s seed head (the top of the plant) is made from three portions: the germ, the bran, and the endosperm. White flour has been stripped of the bran and germ, leaving behind the fine, pale endosperm. It is more shelf-stable than whole wheat flour, but as a result, has a milder flavor. Make This: Just about anything! Cookies, breads, any baked goods. Protein Content: 12% to 14%. Description: Bread flour is the strongest of all flours, providing the most structural support, especially with yeasted doughs. It is made from hard wheat and the high protein content helps to create more gluten and more rise in baked goods. The gluten development contributes to a chewier consistency, which is exactly what you want when making things like artisan breads and bagels. Make This: Bread, bagels, pretzels, anything chewy and requiring plenty of structure. Not That: Tender cakes and pastries. Substitutions: All-purpose flour can most times be substituted for bread flour. While the resulting texture will be slightly altered, using all-purpose flour should not ruin the recipe. Protein Content: 7% to 8.5%. Description: Cake flour is milled to an ultra-fine consistency; the relative lack of gluten-forming proteins makes cake flour ideal for tender baked goods. This allows them to absorb more liquid and rise higher, which creates a tender crumb without adding toughness – an ideal quality in things like tall layer cakes. Pastry flour has many of the same properties as cake flour and can be used interchangeably. 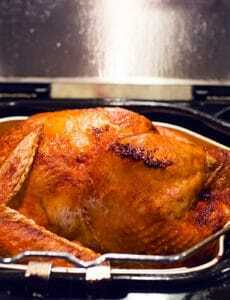 Substitutions: 1 cup all-purpose flour, remove 2 tablespoons of the flour and replace with 2 tablespoons of cornstarch. Protein Content: 8.5% to 9.5%. Description: Pastry flour is made from soft red winter or soft white winter wheat; it absorbs less liquid in recipes and produces a fine crumb in baked goods. Make This: Biscuits, pancakes, pastries, pie crust, cookies, muffins, brownies, pound and sheet cakes. Substitutions: All-purpose flour or cake flour, used alone or in combination. Description: Whole wheat flour is made by milling all three portions of the seed head – bran, germ and endosperm. It is darker in color and creates a more dense and more flavorful baked good than all-purpose flour. Whole wheat flour is more absorbent than all-purpose flour, which means that recipes using whole wheat flour will require more liquid. While it is higher in protein, its gluten-forming ability is compromised by the bran and germ, which is why whole wheat flour produces heavier, denser baked goods. 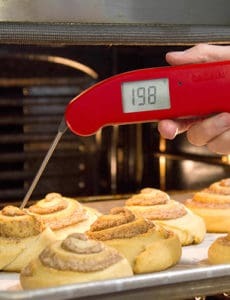 Not That: Cakes, pastries, any delicate baked good. Substitutions: Look for recipes that specifically call for whole wheat flour. If you want to adjust a recipe that calls for all-purpose flour, begin by substituting 25% of the all-purpose flour with whole wheat and work from there, understanding that you may need to increase the liquid in the recipe to achieve the correct consistency as you add more whole wheat flour. Make This: Almost anything you would use all-purpose flour for. Substitutions: You can substitute this on a 1:1 basis for any recipe calling for whole wheat flour. Other recipes can be substituted anywhere from 25% to 50% – check out King Arthur Flour’s Complete Guide: White Whole Wheat Flour. It’s an awesome resource! Description: Self-rising flour has long been a Southern U.S. staple, as it is made from the low-protein wheat that is grown in the south. It has an even lower protein content that all-purpose flour because it’s made using a soft wheat flour rather than the hard wheat flour that makes up all-purpose flour. Self-rising flour also has baking powder and salt added during the milling process. The softer, lower-protein flour creates tender biscuits, muffins and other baked goods. 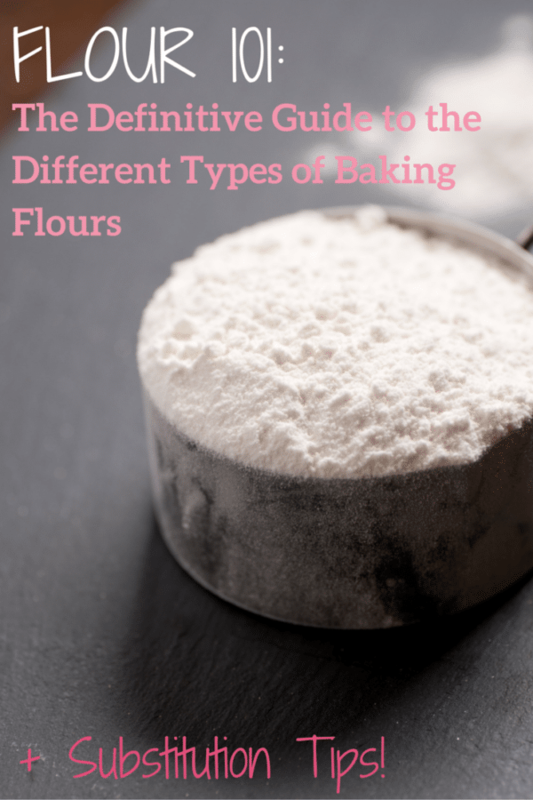 These are the most common flours that you will find listed in a recipe, and the ones that most serious home bakers keep stocked in their pantry. I think it’s worth keeping as much as you have room for, as flour’s shelf life is quite long, as long as it is kept in an airtight container (whole wheat and white whole wheat flours should be kept in the refrigerator or freezer to maintain freshness), and you never know when you’ll stumble upon a recipe that you have to make RIGHT NOW. I hope this has helped demystify some of the question marks surrounding all of the different types of flours, what they’re used for, how to substitute for them, and what you should make with them! I have an eye injury from a car accident that makes it difficult to read computer screens. Do you have a printable version of your articles and recipes? I can only try, but get all the extraneous information that is on the web page along with the article. Hi Helen, First of all, I am so very sorry! And yes, you can print any recipe by using the print recipe button. Hi Nicki, You could do that, you may need to use less liquid in the recipe, though. Hi Tracy, No, I didn’t, as I don’t consider these to be pantry staples for everyday baking. THANK YOU for this post! It’s most helpful, particularly the substitution portion you included with each flour and the what to use/what not to use each flour. Here’s a question: do you personally use bread flour for your yeasted baking? Would you recommend that be used over AP? I’ve had so many failures lately with changing up flours that I’m just a little leary of wasting time and ingredients, so I appreciate your candid thoughts and experience in baking. I think I’ve told you before how valuable your blog is and how much I really love it, but I’ll tell you that all again :) Have a great day. It’s a hockey one . . . Round 2 begins . . . Go PENS! Hi Michelle, It all depends… I don’t use bread flour for all yeast recipes – if the particular recipe is meant to be denser and chewy, then yes. My favorite white bread recipe (I’m going to share it soon!) uses all-purpose flour because it’s a very soft and fluffy bread. I hope that helps? And thank you so much for the kind words :) Bummer of a game last night, but I hope we can get a win tomorrow! The differences as I see them are, first the protein level of the flour (and of the original wheat – as different brands, or house brands, may have different protein levels), and also what type of wheat is used. Bread flour is generally 100% hard wheat flour, while all-purpose flour may be 100% hard wheat flour, or it may be a combination of hard wheat flour and soft wheat flour. Packaging does not always say, though sometimes the company website does, or their customer service line should be able to tell you. Cake and pastry flour is made from soft wheat (lower protein). Depending on the recipe, you may wish to vary the flour. Commercial bakers likely use only bread flour for their bread. Great list! You are missing Whole Wheat Pastry Flour from your list! This is a staple in my kitchen. When baking cookies, brownies or cakes, I substitute half the all purpose flour with whole wheat pastry flour. Product still comes out great, nobody can taste the difference, and you get the benefit of have some whole grains in your sweet treat! Try it! Does KAF all purpose have higher protein than typical grocery brands? Difference in Bread Flour and Sir Lancelot? Hi Jim, According a download on the King Arthur Flour website, their all-purpose flour has a protein content of 11.7% and they claim that “competitor’s all-purpose flour” has a protein content of 9.6% (I assume they would be talking about popular grocery store brands). KAF bread flour has a protein content of 12.7%, Sir Lancelot has 14%. Michelle, Thank you for this “all in one place” information!! ? Thanks for this overview I haven’t even realised there’s sooo many types of flour. I have one more question: currently I am passing through a custard cookies phase. Do you think the type of flour you use makes big difference in a custard preparation? Hi Kate, Are you talking about using flour in making actual custard? Or cookies? I meant the custard. I know that often it doesn’t call for flour at all, but my family is crazy about portuguese dessert called ‘pasteis de nata’ which actually are baked cups of pastry filled with custard which require flour for making. Although they are delicious I make them reluctantly because sometimes they turn out OK, and sometimes the custard filling is kind of watery. After reading your post I started to think that I never pay attention to type of flour I use to make them – I add white wheat flour of any type I have on hand and maybe this is a cause of my culinary failures. Interesting! I’ve never heard of using flour to make custard. What is called for in the recipe you’re using? To thicken the custard I guess. The pastry and custard filling are baked in the same time. The filling in ready to eat pasteis de nata is supposed to be soft and dense in the same time. Hi Michelle! I have a recipe for an El Salvadorian cake that uses rice flour… is it possible to substitute all purpose, bread, or cake flour instead? Do you know what the difference in taste or texture would be? Any advice would be greatly appreciated!! Thanks so much! Hi MaryAnn, From what I’ve read, rice flour is light and mild – a substitution of cake flour or pastry flour would work! Thanks so much, Michelle!! I’m going to try the recipe with cake flour! Thanks for all of your wonderful recipes!! How long do you keep flour? I dump mine in my glass canister and toss the packaging so I never know how long I’ve had it, but I was baking this weekend and I had chocolate chip cookies and biscuits both turn out terribly and they were recipes that I’ve done a million times. I’m thinking my flour might not be fresh anymore. It’s the only ingredient that was the same in both recipes. Hi Kari, I go through all-purpose flour really quickly, and cake flour pretty quickly, too. I use bread flour less often, but I keep all three of those in my airtight containers in the pantry. All of my other flours (whole wheat, nut flours, etc.) I keep in freezer Ziploc bags in my freezer. I throw out my packages too, but I write the expiration date on the bags when I transfer. I don’t typically do it for the ones in my pantry because they get used up so fast. Thanks for all the information. This is a nice simple explanation. Good to have as a reference. Thank you for this! It is going to be so helpful! Hi Rosaline, Ideally you would do this by weight, so if a recipe calls for x ounces or grams of all-purpose flour, use that same weight of cake flour. If you’re using measuring cups, then for every 1 cup of all-purpose flour, substitute 1 cup + 2 tablespoons cake flour. Can you tell me the difference unbleached flour and regular white flour makes when used in baking? Thanks so much! Hi Evelyn, Bleached flour uses bleaching agents to speed up the flour’s aging process. This results in a whiter, finer-grain flour with a softer texture. Foods made with bleached flour tend to have a softer texture, more volume, and a brighter color than those made with unbleached flour. That being said, unless someone is a professional baker (or taste tester! ), you would likely never be able to tell the difference, as the differing results are very slight. You can use them interchangeably for any recipe. Just another note – You want to use unbleached flour if making any bread, especially sourdough. The bleaching agents used in bleached flour will destroy your yeast.